Simple yet trendy, this pack of two bodysuits from the house of Mothercare will be an ideal pick for your kid. 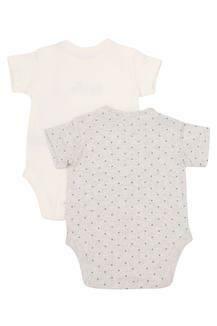 The bodysuits flaunt a solid and a printed pattern, which along with the round neck makes them look distinctive. It also features half sleeves that further enhance its overall appeal. Bring home this set of two bodysuits for your son and dress him smartly for any casual occasion. Let him club it with a pair of casual shoes for the complete look.